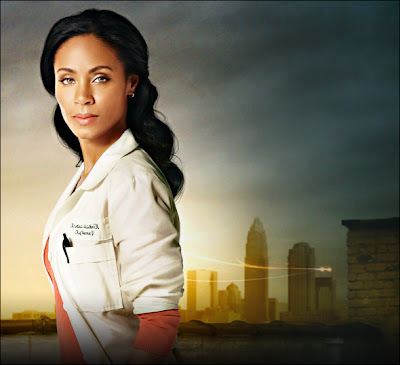 Jada Pinkett Smith (The Women, The Matrix trilogy) executive-produces and stars in HAWTHORNE, a character-driven drama series about a nurse who is a true everyday hero. HAWTHORNE premieres Tuesday, June 16, at 9 p.m. (ET/PT). Pinkett Smith plays Christina Hawthorne, a compassionate and headstrong Chief Nursing Officer heading up a group of dedicated nurses at Richmond Trinity Hospital who spend long days and nights on the hospital’s front lines. Pinkett-Smith was on "The View" today promoting the show and mentioned that she would be spending two months in Beijing this summer with her son Jaden while he shoots the new "Karate Kid" movie. She will be shocked by the thick air pollution if she has never been there. We hope neither she nor Jaden has asthma. If so be careful. Here is the link to our visit to China in 2007.